Of all known fundamental particles, neutrinos may be the most mysterious: Although they are highly abundant in the universe and were discovered experimentally in 1956, researchers still have a lot left to learn about them. To find out more about the elusive particles and their potential links to cosmic evolution, invisible dark matter and matter’s dominance over antimatter in the universe, the Department of Energy’s SLAC National Accelerator Laboratory is taking on key roles in four neutrino experiments: EXO, DUNE, MicroBooNE and ICARUS. Neutrinos were also the central theme of the 43rd annual SLAC Summer Institute for particle physics and astrophysics. The tradition-rich educational event, held Aug. 10-21, attracted more than 150 scientists from around the globe and featured lectures by some of the world’s leading neutrino experts. Francis Halzen, principal investigator of the international IceCube Neutrino Observatory at the South Pole and neutrino specialist at the University of Wisconsin, gave the summer institute’s opening lecture. He said neutrinos have a high potential for scientific discovery – and they are also never boring. As a matter of fact, the history of neutrino research has seen a few surprising twists and turns. Neutrinos are one of the most common fundamental particles in the universe. They are abundantly produced in supernova explosions, star-powering nuclear fusion and other nuclear processes, resulting in trillions of neutrinos passing through us every minute. Yet, they are very difficult to study because they rarely interact with their surroundings and easily evade detection. This explains why it took researchers nearly 30 years to catch a first glimpse of neutrinos, although their existence had been first postulated in 1930 to explain an apparent violation of the conservation of energy in the radioactive decay of unstable atomic nuclei known as beta decay. A few years after the initial discovery in 1956, researchers were caught by surprise when more than one type of neutrino showed up in their experiments. By the turn of the millennium, they had identified three different types, or flavors, each associated with another fundamental charged partner particle: the electron, muon and tau. For the longest time, neutrinos were thought to be massless. But in 1998, scientists discovered that neutrinos frequently change from one flavor into another – a process called neutrino oscillation that can only occur if neutrinos do, in fact, have mass. Although the exact masses remain unknown, researchers estimate neutrinos to be two million times lighter than the next heavier particle, the electron, and this large mass difference is one of the great puzzles of neutrino physics. The origin of neutrino masses could be different from the origin of the masses of other particles. This could explain why neutrinos are incredibly light. One sign that this is true would be if they were their own antiparticles. This is only possible for neutrinos, since they carry no electric charge. The Enriched Xenon Observatory (EXO) is searching for a theorized rare nuclear process – neutrinoless double beta decay – that would prove that neutrinos and antineutrinos are identical. Located almost half a mile underground at the Waste Isolation Pilot Plant in New Mexico, protected from cosmic radiation, the sensitive EXO experiment uses 200 kilograms of enriched liquid xenon that could potentially undergo the sought-after decay. If it exists, it would be so rare that it would take billions of times longer than the age of the universe for half of the radioactive xenon nuclei to decay. Only the large number of xenon atoms in the experiment allows researchers to search for such a long-lived decay. SLAC co-led the construction of the experiment’s 200-kilogram version (EXO-200), which also serves as a test bed for a more sensitive future ton-scale version (nEXO) that would give researchers a much better chance of seeing neutrinoless double beta decay. SLAC researchers are also taking part in another neutrino experiment – the Deep Underground Neutrino Experiment (DUNE), which will be constructed by a new international collaboration hosted at the Long-Baseline Neutrino Facility (LBNF) as the centerpiece of the particle physics program in the U.S.
As part of LBNF, neutrinos and antineutrinos will be sent 800 miles through the Earth from Fermi National Accelerator Laboratory in Illinois to the DUNE detector in South Dakota – an “eye” for neutrinos that will eventually consist of four 10,000-ton modules of liquid argon. Scientists will then track how the particles morph from one neutrino flavor into another along the way. By comparing the oscillations of antineutrinos with those of neutrinos, DUNE researchers will be able to determine if the matter-antimatter siblings behave differently. If they do, the difference could potentially help explain why our universe is made of matter rather than antimatter. “Since each neutrino flavor interacts differently with the material in the Earth, the experiment will also tell us which of the three neutrino types is the lightest and which is the heaviest,” said researcher Mark Convery, who heads SLAC’s LBNF/DUNE group. 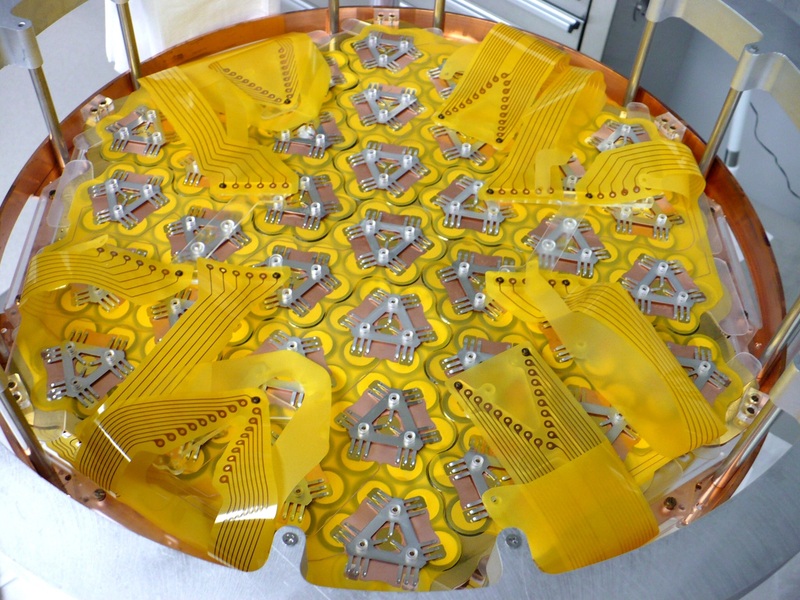 DUNE’s liquid argon detector may also make other experiments possible. It could be used, for instance, to catch a glimpse of neutrino bursts from supernova explosions, which could tell us more about the physics of collapsing stars. Scientists at the joint SLAC/Stanford University Kavli Institute for Particle Astrophysics and Cosmology (KIPAC) are particularly interested in this research opportunity. However, DUNE will not be ready until the mid-2020s. In the meantime, Convery and his team are also engaging in the current MicroBooNE and future ICARUS experiments at Fermilab. These are so-called short-baseline experiments with detectors just hundreds of yards away from the neutrino source, rather than hundreds of miles away. Researchers believe that these anomalies could hint at the existence of a fourth, “sterile” neutrino. This hypothetical particle could potentially be linked to dark matter, the invisible substance that is five times more prevalent in the universe than regular matter. MicroBooNE’s 170-ton liquid argon detector began collecting data in August 2015, while ICARUS, which is three-and-a-half times heavier, is being upgraded at the European particle physics laboratory CERN. Both experiments will eventually become part of a three-detector short-baseline neutrino program at Fermilab, scheduled to launch in 2018 and designed to clarify whether previous hints at sterile neutrinos are correct or not. The Department of Energy has approved the start of construction for a 3.2-gigapixel digital camera – the world’s largest – at the heart of the Large Synoptic Survey Telescope (LSST). 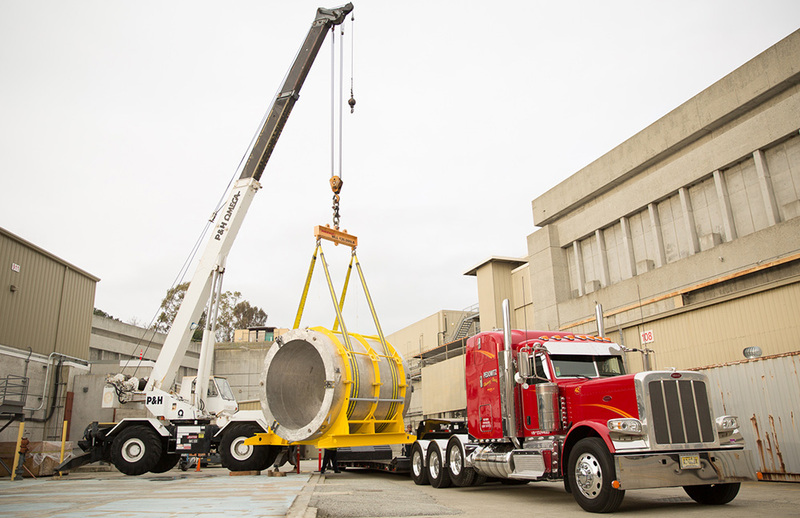 Assembled at the DOE’s SLAC National Accelerator Laboratory, the camera will be the eye of LSST, revealing unprecedented details of the universe and helping unravel some of its greatest mysteries. 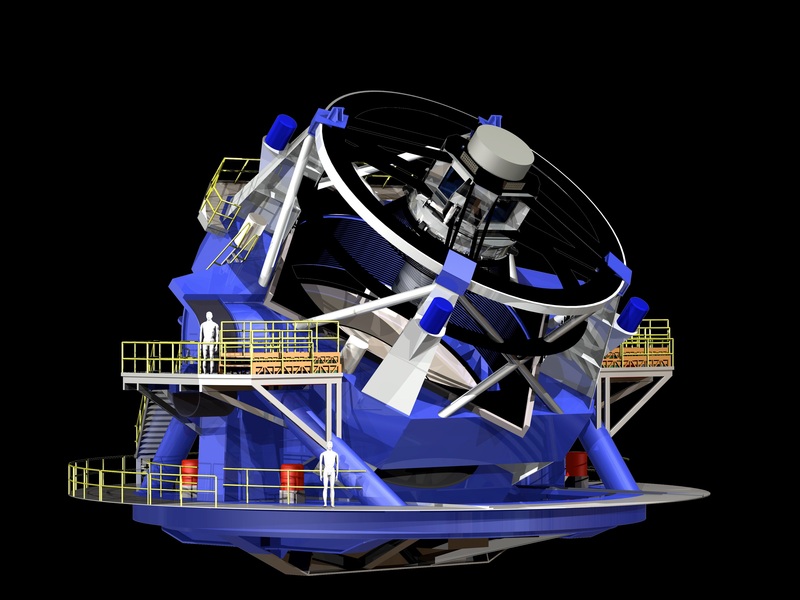 Starting in 2022, LSST will take digital images of the entire visible southern sky every few nights from atop a mountain called Cerro Pachón in Chile. It will produce a wide, deep and fast survey of the night sky, cataloguing by far the largest number of stars and galaxies ever observed. During a 10-year time frame, LSST will detect tens of billions of objects—the first time a telescope will observe more galaxies than there are people on Earth – and will create movies of the sky with unprecedented details. Funding for the camera comes from the DOE, while financial support for the telescope and site facilities, the data management system, and the education and public outreach infrastructure of LSST comes primarily from the National Science Foundation (NSF). The telescope’s camera – the size of a small car and weighing more than three tons – will capture full-sky images at such high resolution that it would take 1,500 high-definition television screens to display just one of them. This has already been a busy year for the LSST Project. Its dual-surface primary/tertiary mirror – the first of its kind for a major telescope – was completed; a traditional stone-laying ceremony in northern Chile marked the beginning of on-site construction of the facility; and a nearly 2,000-square-foot, 2-story-tall clean room was completed at SLAC to accommodate fabrication of the camera. Components of the camera are being built by an international collaboration of universities and labs, including DOE’s Brookhaven National Laboratory, Lawrence Livermore National Laboratory and SLAC. SLAC is responsible for overall project management and systems engineering, camera body design and fabrication, data acquisition and camera control software, cryostat design and fabrication, and integration and testing of the entire camera. Building and testing the camera will take approximately five years. SLAC is also designing and constructing the NSF-funded database for the telescope’s data management system. LSST will generate a vast public archive of data—approximately 6 million gigabytes per year, or the equivalent of shooting roughly 800,000 images with a regular 8-megapixel digital camera every night, albeit of much higher quality and scientific value. This data will help researchers study the formation of galaxies, track potentially hazardous asteroids, observe exploding stars and better understand dark matter and dark energy, which together make up 95 percent of the universe but whose natures remain unknown. The National Research Council’s Astronomy and Astrophysics decadal survey, Astro2010, ranked the LSST as the top ground-based priority for the field for the current decade. The recent report of the Particle Physics Project Prioritization Panel of the federal High Energy Physics Advisory Panel, setting forth the strategic plan for U.S. particle physics, also recommended completion of the LSST. Accelerator technology pioneered at the Department of Energy’s SLAC National Accelerator Laboratory is on its way to powering X-ray science in South Korea: On Aug. 6, the lab shipped one of its unique radio-frequency amplifiers – an XL4 klystron – to Pohang Accelerator Laboratory (PAL), where it will become a key component for the optimal performance of a new X-ray free-electron laser under construction. 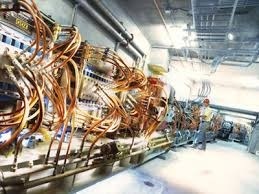 Klystrons are the driving force behind many particle accelerators. They generate powerful radio-frequency fields that provide the energy to bring charged particles up to speed for collision experiments and the production of intense X-rays. However, SLAC’s XL4 klystron, which operates in a particular frequency range known as the X-band, will serve another purpose at PAL: It will power accelerator structures that let scientists optimize the electron beam in the future X-ray laser. 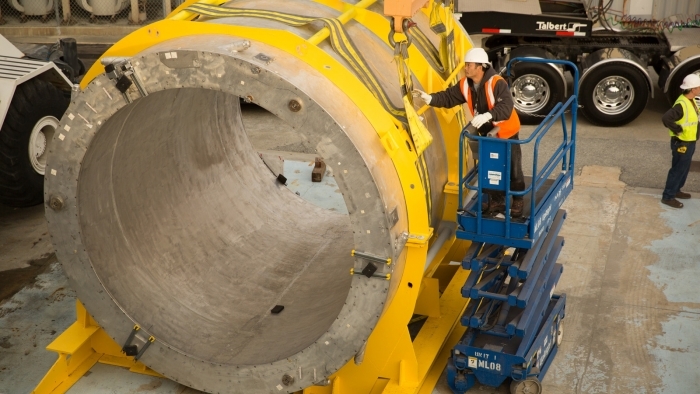 PAL is building an X-ray laser similar to SLAC’s Linac Coherent Light Source (LCLS), a DOE Office of Science User Facility that generates the most powerful X-rays on Earth. With their extremely bright and ultrashort light pulses, X-ray lasers enable groundbreaking research in many scientific areas, from materials science to biology to studies of matter in extreme conditions. These state-of-the-art light sources produce X-ray light by sending short electron bunches on a wavy path inside special magnets. This is where SLAC’s XL4 klystron comes in: It delivers energy to a so-called X-band linearizer – an accelerator structure that manipulates bunches in such a way that they can be optimally shortened in the subsequent bunch compressor. For the South Korean X-ray laser project, PAL therefore began collaborating with SLAC in 2012. The first klystron and other parts are now on their way to PAL. The second klystron, which will serve as a spare but could potentially also be used in a tool to diagnose the X-ray laser’s electron and X-ray beams, is currently being tested. SLAC’s unparalleled expertise with X-band technology goes back to the 1980s when researchers began thinking about an energy upgrade of the lab’s 2-mile-long linear accelerator to enable new particle physics experiments. Given the choice of either building an even longer accelerator or developing klystrons that drive particles to higher energies, scientists opted for the latter. This marked the birth of SLAC’s X-band program. Although the linear accelerator never got its energy upgrade, the X-band technology kept developing. The latest klystron model is the XL4 – an extraordinarily stable radio-frequency source with 50 million watts of peak power. At SLAC, two of them are integrated into LCLS while others power experiments at the lab’s Next Linear Collider Test Accelerator (NLCTA) and Accelerator Structure Test Area (ASTA). “SLAC has built a total of 22 XL4 klystrons to date, including a modified version, called the XL5, for accelerator facilities in Europe,” Jongewaard says. “Three are used in Switzerland: one at CERN and two at the Paul Scherrer Institute. We also built another two for the Elettra research center in Italy.” The XL5 model is now commercially produced by Communications & Power Industries, a Palo Alto-based company. Soon, SLAC’s X-band radio-frequency technology will also benefit science in East Asia: Hopes are that PAL’s X-ray laser will produce its first light in 2016. A new scientific instrument at the Department of Energy’s SLAC National Accelerator Laboratory promises to capture some of nature’s speediest processes. It uses a method known as ultrafast electron diffraction (UED) and can reveal motions of electrons and atomic nuclei within molecules that take place in less than a tenth of a trillionth of a second – information that will benefit groundbreaking research in materials science, chemistry and biology. The technique complements ultrafast studies with SLAC’s X-ray free-electron laser. Similar to X-ray light, highly energetic electrons can take snapshots of the interior of materials as they pass through them. Yet, electrons interact differently with materials and “see” different things. Both methods combined draw a more complete picture that will help researchers better understand and possibly control important ultrafast processes in complex systems ranging from magnetic data storage devices to chemical reactions. The superior performance of the new UED system is due to a very stable “electron gun” originally developed for SLAC’s X-ray laser Linac Coherent Light Source (LCLS), a DOE Office of Science User Facility. This electron source produces highly energetic electrons, packed into extremely short bunches. It spits out 120 of these bunches every second, generating a powerful electron beam that the researchers use to probe objects on the inside. But how can scientists actually catch a glimpse of the interior of materials with particles like electrons? The method works because particles have a second nature: They also behave like waves. When electron waves pass through a sample, they scatter off the sample’s atomic nuclei and electrons. The scattered waves then combine to form a so-called diffraction pattern picked up by a detector. The whole apparatus works like a high-speed camera, capturing differences in diffraction patterns over time that scientists use to reconstruct the sample’s inner structure and how it changes. Since electron bunches in SLAC’s UED instrument are extremely short, they reveal changes that occur in less than 100 quadrillionths of a second, or 100 femtoseconds, for instance in response to ultrashort laser pulses. This animation explains how researchers use high-energy electrons at SLAC to study faster-than-ever motions of atoms and molecules relevant to important material properties and chemical processes. Electrons behave similarly to X-rays in the way they explore speedy phenomena in nature. Electrons scatter off both electrons and atomic nuclei in materials. X-rays, on the other hand, interact only with electrons. Therefore, electron and X-ray studies of very fast structural changes complement each other. The SLAC-led team has already begun to combine both approaches to better understand the link between the magnetic behavior of certain materials and their structural properties in studies that could help develop next-generation data storage devices. Electrons also provide a path to studies that are very challenging to perform with X-rays. For instance, the researchers studied a single atomic layer of a material that is interesting for future electronic devices. The researchers have already mapped out the next steps to further improve the UED instrument. They plan on making it even faster – corresponding to a camera with a shutter speed close to 10 femtoseconds – and will eventually reduce the size of the electron beam from its current 100 microns – the diameter of an average human hair – to below one micron. These advances could be used to investigate how ultrafast motions in tiny regions of materials are linked to magnetism and other material properties. The scientists’ ultimate goal is to turn UED into an ultrafast electron microscope – an instrument that would show details too small to be seen with an optical microscope. Existing electron microscopes can already capture events in 10 billionths of a second, but with SLAC’s instrument, the researchers hope to push the speed limit to processes that are 1,000 times faster. In addition to researchers from SLAC and Stanford University, the research team included scientists from the University of Nebraska, Lincoln, and the University of Duisburg-Essen in Germany. The German research center DESY and SLAC will work closer together in the future: That was the outcome of a meeting of senior managers of both labs who convened July 16-17 at SLAC to discuss a joint strategy for more collaboration. On the first day, SLAC and DESY representatives talked about their labs’ current research activities and future plans, exposing a variety of commonalities and also differences between the research centers. This led to discussions on the second day that identified areas where the labs can best collaborate with each other. SLAC and DESY share a rich history of collaboration and competition. Founded only a few years apart some 50 years ago, both centers were conceived as accelerator labs for particle physics experiments. Over the years, X-rays – an initially unwanted byproduct of particle accelerators – have become an increasingly important tool for science in both locations. Today, SLAC and DESY are multipurpose labs with similarly broad research programs, including accelerator research, particle physics, cosmology, X-ray science, bioscience, chemistry and materials science. Cross-fertilization between disciplines has helped both sides to stay at the forefront of science over the past decades. Similarly, developing a common strategy for cross-fertilization between the labs may further advance technologies that both research centers will need for their continued pursuit of groundbreaking science in the decades to come. The meeting was the first of its kind, kicking off future regular collaboration meetings of the two labs. SLAC and DESY will now form bilateral working groups to flesh out detailed proposals for more collaboration in the identified areas. Senior managers plan on meeting again next year, this time at DESY, to discuss the outcome of the screening process and put some of the proposals forward. A Swedish social scientist who has been studying the Department of Energy’s SLAC National Accelerator Laboratory for nearly a decade says it represents an ideal case study for how a national lab transforms from a primary mission in particle physics to a much broader mix of research fields. Olof Hallonsten of Lund University specializes in studying the policies and practices of “big science” labs – labs that operate large-scale research facilities. His work highlights the forces that set priorities for Big Science and drive research in new directions, and he plans to eventually publish a book about SLAC that combines material from previous studies. Before his time at SLAC, he participated in a study of a science lab in Sweden and became one of the first to join a PhD program in research policy at his university. “I got so interested in this science that I had hardly heard about before. I was really interested in the politics of the Big Science labs,” he said. Starting in 2007, he visited SLAC several times, interviewing Nobel laureates and past and present SLAC and Stanford administrators and carefully combing through the lab archives. “The more I learned about SLAC, the more it became clear to me that this was one of the most exciting examples of a full-scale transformation,” Hallonsten said. “All that glorious history in particle physics – and then it manages to reinvent itself and renew itself. Hallonsten has written book chapters and research papers about other science facilities in the U.S. and abroad, and about parallels in the changing focus of research at SLAC and Germany’s DESY lab. Both labs evolved from a particle physics focus into more diverse disciplines, including “photon science,” which includes X-ray research and more broadly the interaction of light with matter. Ingolf Lindau, a native of Sweden who is a professor emeritus at Stanford and SLAC, had helped Hallonsten with his early research and suggested SLAC as a possible study subject. Looking back on his first visit in 2007, Hallonsten realized he had witnessed a pivotal time in the lab’s history, when it was rapidly transitioning away from a primary focus in particle physics. The lab’s premier particle physics project of that era, called BaBar, shut down in 2008 along with the PEP-II ring, which had accelerated electrons and their antiparticles for collisions that would allow scientists to study the imbalance between matter and antimatter that shapes our universe. Not far behind was the turn-on of the Linac Coherent Light Source (LCLS) X-ray laser in 2009. It would provide a powerful new source of X-rays to complement and extend the types of experiments that SLAC’s first X-ray research facility, now known as the Stanford Synchrotron Radiation Lightsource (SSRL), had enabled. Both are DOE Office of Science User Facilities. One of his major research focuses at SLAC has been the birth and growth of SSRL as a window into larger changes at the lab. Launched in July 1973 as a Stanford pilot project, by 1974 it became the Stanford Synchrotron Radiation Project (SSRP), a National Science Foundation-funded national user facility. It extracted synchrotron radiation – waste X-ray light from an accelerator beam used in particle collider experiments – for research in a wide range of fields. A DOE user facility since 1982, SSRL now operates 33 experimental stations, drawing more than 1,500 scientists from around the globe each year. At first these synchrotron radiation experiments were defined as a “parasitic” use that was not allowed to interfere with particle physics experiments, and they were sometimes suspended or greatly curtailed. Hallonsten credits concerted and continuing local efforts by SLAC and Stanford administrators and scientists, along with support from national agencies, for finding ways to support and grow synchrotron research at SSRP and then SSRL by changing national and laboratory-level priorities. From its modest beginnings, SSRL developed into an internationally known facility that has contributed to Nobel Prize-winning research. A biomedical breakthrough, published today in the journal Nature, reveals never-before-seen details of the human body’s cellular switchboard that regulates sensory and hormonal responses. The work is based on an X-ray laser experiment at the Department of Energy’s SLAC National Accelerator Laboratory. The study has been hailed by researchers familiar with the work as one of the most important scientific results to date using SLAC’s Linac Coherent Light Source (LCLS), a DOE Office of Science User Facility that is one of the brightest sources of X-rays on the planet. The LCLS X-rays are a billion times brighter than those from synchrotrons and produce higher-resolution images while allowing scientists to use smaller samples. Arrestins and another class of specialized signaling proteins called G proteins take turns docking with GPCRs. Both play critical roles in the body’s communications “switchboard,” sending signals that the receptors translate into cell instructions. These instructions are responsible for a range of physiological functions. Until now, only a G protein had been seen joined to a receptor at this scale, one of the discoveries recognized with the 2012 Nobel Prize in Chemistry. Before the study at SLAC, little was known about how arrestins – which serve a critical role as the “off” switch in cell signaling, opposite the “on” switch of G proteins – dock with GPCRs, and how this differs from G protein docking. The latest research helps scientists understand how a docked arrestin can block a G protein from docking at the same time, and vice versa. “The new paradigm in drug discovery is that you want to find this selective pathway – how to activate either the arrestin pathway or the G-protein pathway but not both — for a better effect,” said Eric Xu, a scientist at the Van Andel Research Institute in Michigan who led the experiment. The study notes that a wide range of drugs would likely be more effective and have fewer side effects with this selective activation. Xu said he first learned about the benefits of using SLAC’s X-ray laser for protein studies in 2012. The microscopic arrestin-GPCR crystals, which his team had painstakingly produced over years, proved too difficult to study at even the most advanced type of synchrotron, a more conventional X-ray source. “While this particular sample serves a specific function in the body, people may start to use this research as a model for how GPCRs, in general, can interact with signaling proteins,” Xu said. His team had been working toward this result since 2005. Qingping Xu, a scientist in the Joint Center for Structural Genomics at SLAC’s Stanford Synchrotron Radiation Lightsource who helped to solve the 3-D structure, said it took many hours of computer modeling and data analysis to help understand and refine its details. “This structure is especially important because it fills in a missing piece about protein-binding pathways for GPCRs,” he said. Even so, he noted that much work remains in determining the unique structures and docking mechanisms across the whole spectrum of GPCRs and associated signaling proteins. In addition to scientists from SLAC, including LCLS and SSRL’s Joint Center for Structural Genomics, and the Van Andel Research Institute, the study also included researchers from: Arizona State University, University of Southern California, DESY lab’s Center for Free Electron Laser Science in Germany, National University of Singapore, New York Structural Biology Center, The Scripps Research Institute, University of California, Los Angeles, University of Toronto, Vanderbilt University, Beijing Computational Science Research Center in China, the University of Wisconsin-Milwaukee, Chinese Academy of Sciences, Paul Scherrer Institute in Switzerland, Trinity College in Ireland, University of Chicago, University of Konstanz in Germany, Chinese Academy of Sciences, Center for Ultrafast Imaging in Germany, and University of Toronto. A new study shows that the recently developed Compact Light Source (CLS) – a commercial X-ray source with roots in research and development efforts at the Department of Energy’s SLAC National Accelerator Laboratory – enables computer tomography scans that reveal more detail than routine scans performed at hospitals today. The new technology could soon be used in preclinical studies and help researchers better understand cancer and other diseases. With its ability to image cross sections of the human body, X-ray computer tomography (CT) has become an important diagnostic tool in medicine. Conventional CT scans are very detailed when it comes to bones and other dense body parts that strongly absorb X-rays. However, the technique struggles with the visualization and distinction of “soft tissues” such as organs, which are more transparent to X-rays. The amount of detail in a CT scan depends on the difference in brightness, or contrast, which makes one type of tissue distinguishable from another. The absorption of X-rays – the basis for standard CT – is only one way to create contrast. Alternatively, contrast can be generated from differences in how tissues change the direction of incoming X-rays, either through bending or scattering X-ray light. These techniques are known as phase-contrast and dark-field CT, respectively. However, these methods require X-ray light with a well-defined wavelength aligned in a particular way – properties that conventional CT scanners in hospitals do not deliver sufficiently. For high-quality phase-contrast and dark-field imaging, researchers can use synchrotrons – dedicated facilities where electrons run laps in football-stadium-sized storage rings to produce the desired radiation – but these are large and expensive machines that cannot simply be implemented at every research institute and clinic. Conversely, the CLS is a miniature version of a synchrotron that produces suitable X-rays by colliding laser light with electrons circulating in a desk-sized storage ring. Due to its small footprint and lower cost, it could be operated in almost any location.